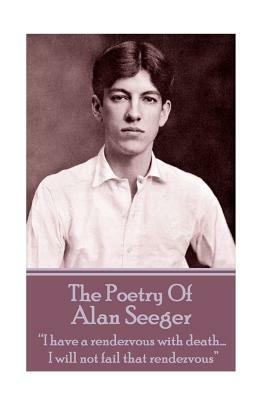 Alan Seeger was born on June 22nd 1888 in New York. The family moved to Staten Island when he was 1 for 9 years and then on to Mexico until he was 12. After attending several elite preparatory schools he enrolled at Harvard in 1906 where he also edited and wrote for the Harvard Monthly. He graduated in 1910 and went to live the life of a bohemian in Greenwich Village, New York thereafter moving to Paris to continue his poetry writing in the Latin quarter. War's looming dark shadow was to have a transformative effect on the young poet and on August 24th 1914 he joined the French Foreign Legion so he could fight for the Allies. On American Independence day, July 4th, 1917 whilst urging on his fellow soldiers in a successful charge at Belloy-en-Santerre he was hit several times by machine gun fire and died. His poetry was published posthumously later that year, it was not a great success but his poem 'I Have a Rendezvous with Death . . .' is now regarded as a classic. On the sixth anniversary of his death a memorial to the American volunteers was unveiled in the Place des Etats-Unis. The memorial was created by Jean Boucher who had used a photograph of Seeger as his inspiration. Two quotes from his poem 'Ode in Memory of the American Volunteers Fallen for France are inscribed upon it: "They did not pursue worldly rewards; they wanted nothing more than to live without regret, brothers pledged to the honour implicit in living one's own life and dying one's own death. Hail, brothers Goodbye to you, the exalted dead To you, we owe two debts of gratitude forever: the glory of having died for France, and the homage due to you in our memories.